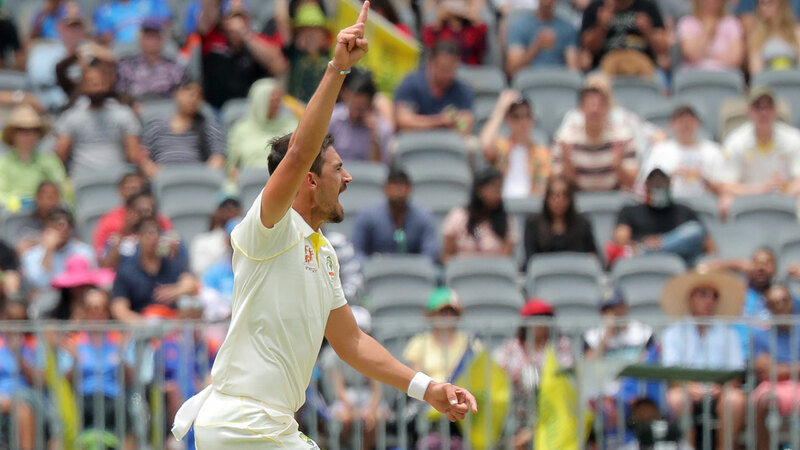 Wounded by questions over his role as Australia's pace spearhead, Mitchell Starc has needed just 12 balls to answer his critics in the second Test in Perth. Starc struck with the final ball before lunch on day two in Perth, clean bowling Murali Vijay for a duck with a ripping inswinger to leave India 1-6 in their first innings, in reply to Australia's 326. Starc's wayward performance in Adelaide drew plenty of criticism, led by Shane Warne, who suggested Starc would be bowling for his spot in the Test XI in Perth. The left-armer struggled to find his radar at times as India claimed a 31-run victory in the series opener. Australian women's cricketing star Alyssa Healy took to social media to defend her husband, posting an article which highlighted that Starc was closing in on 200 Test wickets at a record strike rate for an Australian bowler. Skipper Tim Paine's suggestion that Starc would be fired up to respond on a lively Perth Stadium deck quickly proved to be on the money. "I think the criticism he's come under this week has been pretty unfair, to be honest ... his best and his worst are getting closer together and I think we're getting really close to his best again," Paine said on the eve of the Perth Test. "He swung the ball in Adelaide, which he didn't do in the UAE. I think he'll swing it out there (in Perth) - I think the conditions are going to suit him down to the ground.